A full, rich beer designed with hardworking men and women in mind. Mild roast and chocolate, balanced perfectly with the smoothness of flaked oats. Silky, smooth and full bodied, this beer pairs well with sharp cheeses and a variety of creamy desserts. Checkmate is a beer built on innovation. This lager is a redesign of a classic German beer featuring regional ingredients while retaining its roots. A beer created to be enjoyed on every occasion, with friends and family, as a perfect fuel for your creative endeavors. Building a civilization is a lot of effort and can work up quite a thirst. Dawn of Civilization is our version of the quintessential pint for a hot afternoon on the patio. Combining the acidity and sweetness of citrus fruit with the smoothness of wheat, highly carbonated to produce an aromatic refreshing ale best served with a slice of orange. Beer has always been a necessity when making treacherous journeys around the globe, a source of clean drinking water for early explorers and a method of calming nerves before a flight for modern travelers. Mission to Mars continues on this tradition giving forward looking adventurers a hop driven pale ale to fuel their own journey. The subdued malt bill allows for a showcase of German Mandarina Bavaria accented with Citra and Ekuanot hops. A dry citrus finish to the beer makes it the perfect aperitif. Finding new places to explore have driven people to things that are out-of-this-world. Dark Side of the Moon harks back to an era with ships filled to the gunnels with hop laden beer discovering new lands. Loaded with a blend of Citra and Mosaic hops this beer is smooth enough for the everyday beer drinker, while having all the components needed to satisfy even the most discerning hop-heads. The introduction of colour photography was revolutionary. Film makers could now show the world a lush green forest, brilliant yellows and reds in a sunset and the blue of the ocean. Living in Colour is our way of bringing a little more colour to our line up of beer. Featuring mild hops and a solid malt backbone, Living in Colour is an easy drinking ale. Some people like to test their limits and see what their body can do when pushed to the extreme. Other people like to relax on the couch and binge watch an entire season of their favorite television show. Ascent to the Summit is a perfect beer to match whatever you have planned. This beer has a decadent chocolate flavour that pairs impeccably with hazelnut and a sweet fruity finish. No one person can achieve as much as a strong collective of individuals. Similarly, beer can not rely solely on one ingredient. No Man’s an Island is the perfect balance of residual sweetness, hop bitterness and kilned malts. Chocolate notes are paired wonderfully with a hint of toasted coconut. Designed, built and tested throughout the 1950’s, the Avro Arrow was the pinnacle of the Canadian aviation industry. The project was canceled in 1959, sending dozens of Canadian engineers south of the border in search of meaningful work with NASA. Our version of the Avro Arrow looks to bring back the glory days of Canadian innovation. Easy drinking and malt forward with a balanced of hop bitterness, Avro Arrow is the perfect beer to pair with any brainstorming session. Our latest seasonal release, brewed in celebration of the Bavarian Oktoberfest tradition, Theory of Relativity is a thinking man/woman’s beer. This exceptionally smooth malt-forward lager is brewed with a blend of Canadian 2-Row, Vienna and Munich malted barley. Drinks slightly sweet at the start but finishes with the same satisfying crispness as any of the best lagers on the market. Pairing this with any meal will make you look like the genius. A recognizable marker on the horizon after a long journey at sea can make even the gruffest sailor smile. Aid to Navigation is malt forward with a slightly sweet finish that will draw in even the most critical drinkers. Let this 80 Shilling be your beacon. For thousands of years humans looked up at the moon in awe. Four adventurers boarded a space craft and finally made the journey. Sea of Tranquility is a tropical IPA featuring Idaho 7, Azacca and Amarillo hops, brewed to inspire the adventurer in all of us this summer. This refreshing India Pale Ale is bursting with pineapple, mango and citrus aroma and flavour - perfect for your next voyage, no matter the distance. 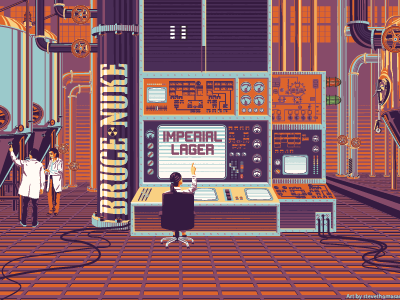 The largest nuclear power generating station in the world deserves to have a beer named in its honor. The strongest beer that we have brewed to date was the only thing that would fit the bill. This one goes out to all the men and women working hard to keep the lights on and all the cogs turning down here at Grey Matter Beer Company, cheers! Some days you just want to get away from your everyday grind. Escape to the Stars is our attempt to get you away from your everyday beer. Our dry hopped beer is kettle soured for 24 hours and then dry hopped after fermentation. This beer is crisp, tangy and extremely refreshing. Some say two heads are better than one. We teamed up with our friends at the Tartan Tusk to roast and blend 200 kg of fresh Ontario grown peaches for this one-of-a-kind brew. Lactose and roasted peaches give the beer a sweeter finish and makes it the perfect ending to a great summer on the shores of Lake Huron. Best enjoyed the way it was made - with friends, around a roaring fire.